خداپرست, مهدی. (1390). روشی پیشنهادی برای تعیین وضعیت لایه‌بندی با استفاده از روش‌های زمین‌آمار و تحلیل گروهی. نشریه انجمن زمین شناسی مهندسی ایران, 4(شماره 3 و 4), 75-90. مهدی خداپرست. "روشی پیشنهادی برای تعیین وضعیت لایه‌بندی با استفاده از روش‌های زمین‌آمار و تحلیل گروهی". نشریه انجمن زمین شناسی مهندسی ایران, 4, شماره 3 و 4, 1390, 75-90. خداپرست, مهدی. (1390). 'روشی پیشنهادی برای تعیین وضعیت لایه‌بندی با استفاده از روش‌های زمین‌آمار و تحلیل گروهی', نشریه انجمن زمین شناسی مهندسی ایران, 4(شماره 3 و 4), pp. 75-90. خداپرست, مهدی. روشی پیشنهادی برای تعیین وضعیت لایه‌بندی با استفاده از روش‌های زمین‌آمار و تحلیل گروهی. نشریه انجمن زمین شناسی مهندسی ایران, 1390; 4(شماره 3 و 4): 75-90. شناسایی لایه‌های زیر سطحی و تعیین نیم‌رخ لایه‌ها در روش‌های معمول مطالعات ژئوتکنیک بر اساس مقطع حاصل از گمانه‌های حفر شده با درون‌یابی و قضاوت فردی انجام می‌شود. در بعضی موارد چنان‌چه فاصله بین گمانه‌ها زیاد باشد با استفاده از انجام آزمایش‌های در محل نظیر آزمایش‌های نفوذسنجی دینامیکی در بین گمانه‌ها سعی می‌شود تعیین لایه‌بندی با دقت بیشتری انجام پذیرد. در این مقاله با فرض در اختیار داشتن اطلاعات مربوط به حفر چند گمانه و انجام آزمایش‌های نفوذسنجی دینامیکی در بین گمانه‌ها، روش جدیدی مبتنی بر استفاده از دو فن زمین‌آمار و تحلیل گروهی ارائه می‌شود که با استفاده از آن می‌توان دو دسته اطلاعات حاصل از گمانه‌ها و نفوذسنجی را ترکیب کرد و وضعیت لایه‌بندی و تغییر مقاومت لایه‌ها را در عمق تعیین نمود. در روش مذکور با ارائه تعریفی جدید برای برخی از مفاهیم زمین‌آمار، یک سطح نسبت به یک نقطه مبنا تعیین می‌شود که در آن سطح، وضعیت لایه‌ها و تغییر مقاومت ثابت است. سپس با استفاده از اعمال روش تحلیل گروهی بر نتایج آزمایش‌های نفوذسنجی دینامیکی در محدوده مذکور، نیم‌رخ مربوط به لایه‌ها تعیین می‌شود. The investigation and estimation of surface subsidence and ground settlement is an important aspect in the design of shallow tunnels in urban areas. Proper exploration could lead to correct measures and avoiding any damage to structures over and underground. 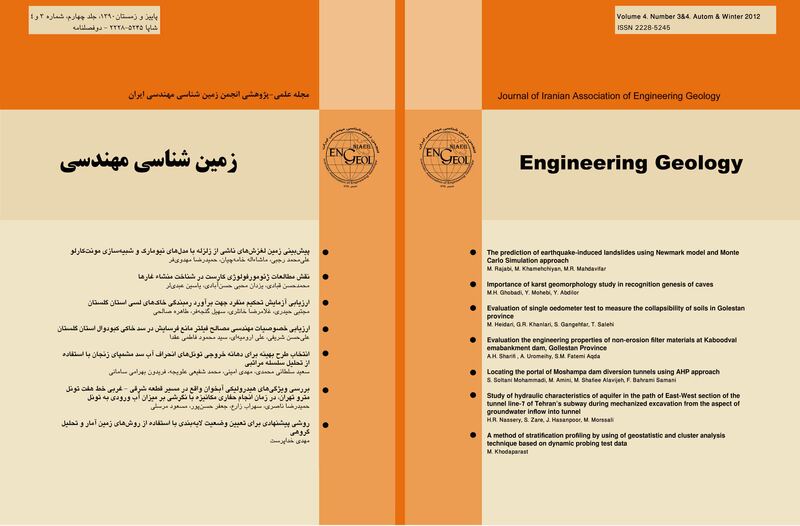 In this study, four sections of the east-western part of Tehran’s Metro Line 7 with the most potential for surface subsidence were chosen and studied. This part of the metro project is positioned in the young alluvial deposits of Tehran and consists mainly of fine grained soil. Ground settlement requires three dimensional design. Hence, FLAC 3D was used to investigate the surface subsidence of the ground along the tunnel route in sections mentioned above. One of the most important advantages of three dimensional design is the possibility of stepwise excavation, and to explore the effect of each excavation step on the surrounding ground. Hence, the stepwise excavation was carried out and continued in 1.5 m advancing stages, until the advancement stopped affecting the ground settlement at the point over the tunnel portal considered in the model. Even though, analytical and empirical methods are unable to evaluate the effect of ground water and the effect of overburden due to the presence of structures and traffic at the surface, because of not installing the monitoring system, analytical methods suggested by Sagaseta, Loganathan and Poulos, Verruijt and Booker, and Bobbet, and also Peck’s empirical method were used to investigate the ground settlement in this project. After using the various methods to study the four chosen sections of the metro line, and analyzing the settlement curves in these sections, it was concluded that the ground settlements is permissible (except the second section). تاج الدین، ر. 1376. مدل‌سازی آماری توزیع سه بعدی مشخصه‌های ژئوتکنیکی خاک. پایان‌نامه کارشناسی ارشد مهندسی خاک و پی، فرزانه، اورنگ (راهنما)، گروه مهندسی عمران دانشکده فنی دانشگاه تهران، 209 ص. حسنی پاک، ع. ا. 1377. زمین‌آمار. نشر دانشگاه تهران، 314 ص. خداپرست، م. و فاخر، ع. 1389. کاربرد کاوشگر دینامیکی در مطالعه خاک‌های ریزدانه و بررسی تکرارپذیری نتایج. چهارمین همایش بین‌المللی مهنـدسی ژئوتکنیک و مکانیک خاک ایران، تهران. خداپرست، م. و فاخر، ع. 1384. توسعه تکنیک‌های شناسایی ژئوتکنیکی خاک‌ها با کاوشگرهای دینامیکی در پروژه‌های آبی. گزارش تحقیقی، مرکز تحقیقات آب وزارت نیرو. داس، ب. م. ،1372. اصول مهندسی ژئوتکنیک، مکانیک خاک. صالح زاده، حسین (مترجم)، جلد دوم، نشر دانشگاه علم و صنعت، 380 ص. رندو، ج. م. ، 1371. اصول زمین‌آماری. خدایاری، علی‌اصغر (مترجم)، نشر جهاد دانشگاهی دانشگاه تهران، 212 ص. شکرانی، ح. 1379. ساخت، بکارگیری و کالیبره نمودن ابزار مکینتاش برای شناسایی زمین. پایان‌نامه کارشناسی ارشد مهندسی خاک و پی، فاخر، علی(راهنما)، گروه مهندسی عمران دانشکده فنی دانشگاه تهران، 77 ص. مدنی، ح. 1373. مبانی زمین‌آمار. نشر دانشگاه صنعتی امیرکبیر، 660 ص.
Alam, M.J., Azad, A.K., Rahman, Z., 2008. Prediction of Liquefaction Potential of Dredge Fill Sand by DCP and Dynamic Probing. Proc. Seismic Engineering Conference, Reggio Calabria, Italy, pp 413-418. Baecher, G.B., Christian, J.T., 2003. Reliability and Statistic in Geotechnical Engineering. Wiley and Sons, Inc., 605 p.
Butcher, A.P., Mcelmeel, K., Powel, J.J. M., 1996. Dynamic probing and its use in clay soils. Advance in Site Investigation Practice, Thomas Telford, London, pp. 383-395. Card, G.B., Roche, D.P., Herbert, S.M., 1990. Application of continuous dynamic probing in ground investigation: Field Testing in Engineering Geology. Geological Society Engineering Geology Special Publication No 6: pp. 129-135. Chiasson, P., Lafleur, J., Soulié, M., Law, K.T., 1995. Characterizing spatial variability of a clay by geostatistics. Canadian Geotechnical Journal, Vol. 32: pp. 1-10. DIN 4094, 1974. Dynamic and Static penetrometers: Dimensions of apparatus and method of operation. Deutsches Institut fur Normung e. V. Berlin. Eitner, V., Katzenbach, R., Stolben F., 2004. International and European Standards on characterization. Proc. 2nd Int. Conf. Geotechnical and Geophysical Site Characterization, Porto, pp. 307-313. Facciorusso J., Uzielli M., 2004. Stratigraphic profiling by cluster analysis and fuzzy soil classification from mechanical cone penetration tests. Proc. 2nd Int. Conf. Geotechnical and Geophysical Site Characterization, Porto, pp. 905-912. Fakher, A., Khodaparast, M. Jones, C.J.F.P., 2006. The use of Mackintosh Probe for site investigation in soft soils. Q.J.E.G. London, No. 39: pp. 189-196. Sabtan, A.A., Shehata, W.M., 1995. Mackintosh Probe as an exploration tool. Bulletin of the International Association of Engineering Geology, Paris, No. 50: pp. 89-94. Fakher, A., Khodaparast, M., Pahlvan, B., 2001. Coastal soft clay improvements using preloading - A case study. Proceeding of 3rd International Conference Soft Soil Engineering, Hong Kong, pp. 465-469. Gaba, A.R., Pickles A.C., Oliveira R., 2004. Casa da música do Porto: Site characterization. Proc. 2nd Int. Conf. Geotechnical and Geophysical Site Characterization, Porto, pp. 1089-1096. Huntley, S.L., 1990. Use of dynamic penetrometer as a ground investigation and design tool in Hertfordshire. Field Testing in Engineering Geology: Geological Society Engineering Geology Special Publication, No. 6: pp. 145-159. Low, I.J., Zaccheo¸ P.F., 1990. Subsurface explorations and sampling. Foundation Engineering Handbook, Fang, Y.H. (eds), Chapman & Hall Publishers, pp. 12-14. Miyamoto, S., 1990. Fuzzy sets in information retrieval and cluster analysis. Kluwer Academic Publishers, 251 p.
Neter, J., Wasserman, W., Kutner, M.H., 1990. Applied linear statistical models: Regression analysis of variance and experimental designs. Richard D. Irwin, Inc., 1012 p.
Phoon, K.K., Kulhawy, F.H., 1995. Characterizing of geotechnical variability. Canadian Geotechnical Journal, Vol. 36: pp. 612-624. Phoon, K.K., Kulhawy, F.H., Grigoriu, M.D., 1995. Reliability based foundation design for transmission line structures. Electric Power Research Institute, Palo Alto, Report TR-105000.